I getting me an external Antenna, cause I am currently getting 32Mbps Down and 3Mbps. Care to share what DNS servers you are running... ? B315 doesn't allow you to change the DNS (at least for WiFi anyway). So Telkom default. Did try manual settings (with Google DNS servers) on device, but that didn't help either. Rebooting a few times sorted it out. experiencing exactly the same issue. Fantastic down speed! You should have that picture framed. Has it been explained why the up speeds on LTE are so atrocious? Was thinking the same even though I live within a KM of 3 cell towers. And I sit with 18mbps average download only! So since the big storm that ripped through KZN on the weekend the speeds have been amazing. + 60Mbps on every Speedtest. Or perhaps they have just added capacity over the weekend. It does - you just need to use the LTE toolbox. Works fine. I changed mine to point to Google by default. Okay, will check it out. Been having serious issues on the Telkom LTE network in my area since Friday last week. 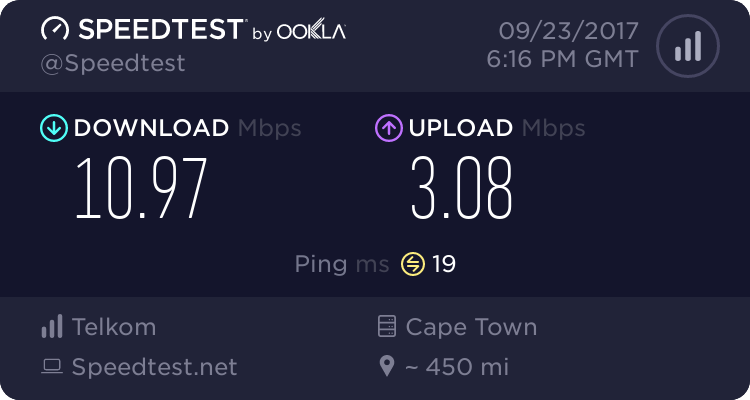 I thought I was being shaped, but as I'm on uncapped LTE, as well as prepaid Telkom on my phone, I confirmed that I get the same terrible speeds on both my router and phone. I am in Moreleta Park. Anyone else getting the results I do? Since last night at least close to 18mbps for LTE on average. Lower average than in the past but better than below 2mbps I got last week. These days I around 14mbps on average on the Smart Wireless Uncapped LTE sim. The day they installed the booster I got about 62mbps and a average of about 57mbps. Yep I hit 72 mbps then averaged 50mbps which declined to 32-35mbps. Then down to 18 mbps average. But mostly below 10mbps during peak. Does anyone know what speeds you get on the Telkom LTE-A network ?